Configuring Wonder is an installation that responds to the world heritage site of Scenic World (Blue Mountains, Australia) as a tourist attraction, a natural ‘wonder’, and a delicate ecosystem. 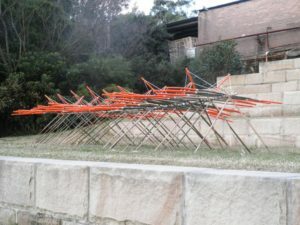 It was created for ‘Sculpture at Scenic World 2013’ and exhibited along with the work of 35 other selected Australian and International artists. Classical notions of beauty include three ’ingredients’: symmetry, proportion and harmony. These notions are also principles of composition throughout art history and abundantly evident in the natural world. Configuring Wonderapplies these principles and explores the discord between notions of beauty and wonder and the use of nature by man. Using the ever present polygon in nature as the foundation for multiple forms they are distorted by the straining of delicate sticks against fabric, tied and tethered all while awkwardly ‘performing’ for the viewer. Between the large number of forms, and their interactions with the flora of the rain forest there is an uncomfortable striving for balance and equilibrium amongst excess (the golden mean). The work integrates closely with the site, allowing ferns and small trees to protrude through the installation. Over 60 fabric sculptures are configured in a large diamond shape covering 24 square metres and suspended on a wire net above the floor of the rain forest. The fabric sculptures are varied in size and shape: some are tethered to bamboo frames and stretched and contorted; others are attached to a golden framework with sticks pushing and distorting the surface. In sunlight the forms are semi-translucent with the outline of delicate sticks visible through the fabric. The installation was created in response to a site visit in 2012 and took into account the unique physical and aesthetic qualities of its location.